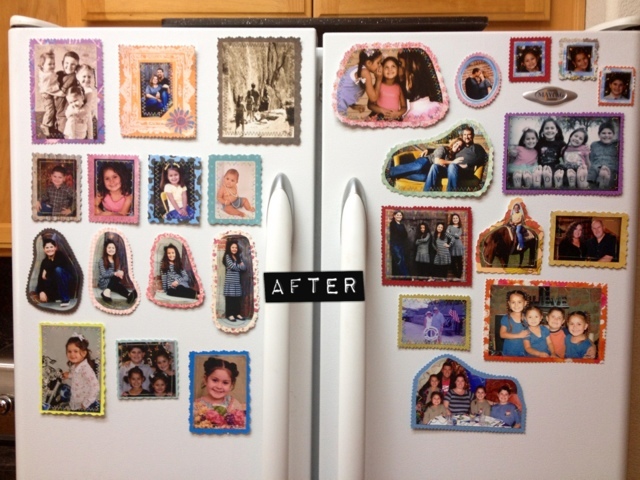 I have been wanting to make-over my fridge for a long while. I love the kids artwork on there and I am sure they will have new art on there again very soon, but I cleaned it off for today to make room for some new things I made. 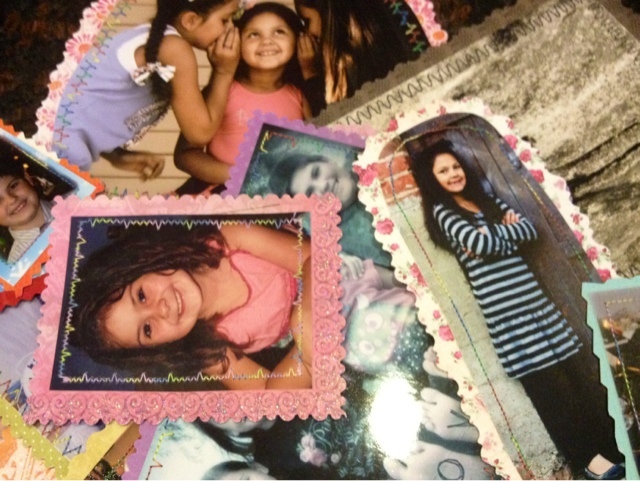 Last week I shared my daughters collage for school. We stitched photos together with scrapbook paper and it turned out so adorable. I knew I had to make some for my fridge. This is my before pic. It's not horrible, just a little messy. But yes, again I love clutter of kids art! So we picked out some of our favorites (there will be more, a lot more, just haven't finished them yet) and some scrapbook paper. 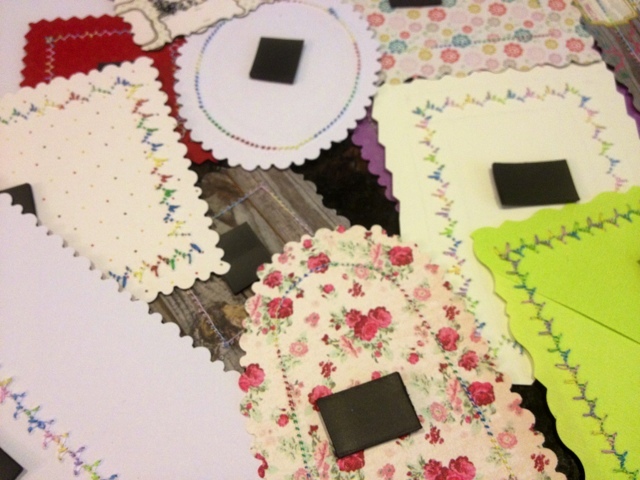 We then sat down at the sewing table to put them all together. After each photo was sewed, we also used some fancy scissors to give the edges a fun look too. Here are some up close. We used different stitches and also multicolored thread. 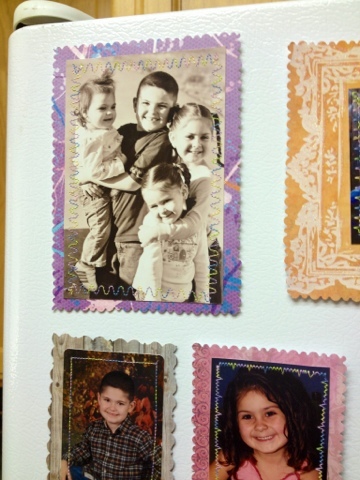 Now all you have to do is put them up on the fridge. Doesn't that look much cuter?!? 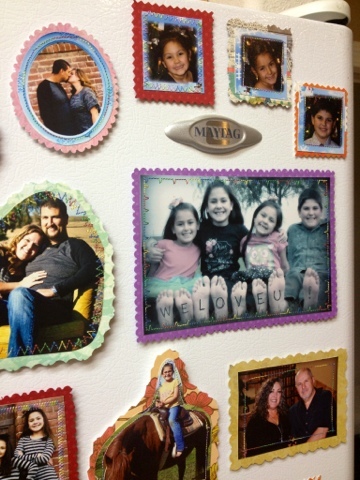 What I really love is now you don't have a magnet covering up your photo. You can see the whole thing. YAY! Sorry if they are a little fuzzy. I admit, these are phone pics today. So? What do you think? Love it? I do! And you know what else is fun about these? You can easily change them out for each season or holiday. Just rotate in the photos you want. GIFTS....these would be so fun to make up to give as gifts too!!! 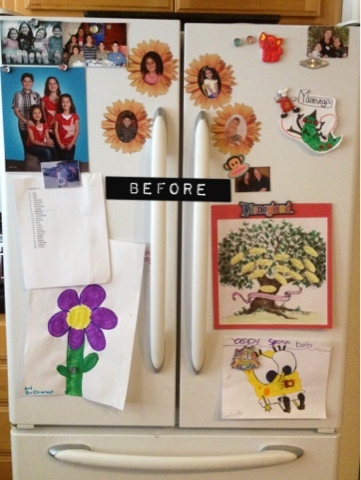 Obviously you can make endless magnets for your fridge. Have fun and please share what you did. Have a great day everyone! Tonight is my daughters first volleyball game ever! Wish her and her team luck. Me too! I am helping coach the team. Eeeekkk! So excited! I love this idea. I didn't know they had rolls of magnet tape.